When I started out road running in about 1958 the Scottish Marathon Club was the group you had to join. Organised by Jimmy Scott, Dunky Wright and an excellent committee. it produced a fixture list every year on which the Edinburgh to North Berwick (then a 22.6 miles distance) was an annual feature. In 1962 I set out to do as many races on the SMC programme as possible – the Balloch to Clydebank, the Clydebank to Helensburgh and the Springburn 12 were all easy to get to with manageable distances, the Strathallan and the SAAA Marathon were also easy to get to because so many folk travelled to them although the distances were starting to get difficult. Edinburgh to North Berwick was more difficult – a student with no car could maybe get there by train but how on earth did you get back from North Berwick? Travel was at times a real difficulty but Jimmy Scott came to the rescue and took several of us through in his minivan – as indeed he did to many other events (Dundee ASA, Spean Bridge to Fort William, the Ben Nevis, the Derwentwater 10 for instance – including myself and Jack MacLean of Bellahouston. The weather was fine apart from a headwind for about 20 of the 22.6 miles and the race started outside St Andrews House with a long downhill run past Meadowbank and on down the coast to North Berwick. My memory is of a race that should have been down hill seeming to involve a lot of running up long drags! The drops were short and steep and appeared to be followed by long gradual gradients. It was one that I wanted to do and looking through the Scottish Marathon Minute Books its history was long and noble. It has gone through many metamorphoses since then with the distance varying up to and including the marathon and the whole history is on Brian Howie’s admirable website (http://www..b-howie.demon.co.uk) referred to below. There have been many double winners – Alex Wight, David Wyper, Martin Coyne, Robin Thomas, Lindsay Robertson and James McMillan but only one man has won it three times – Colin Hutt about whom more can be read on the Two Bridges pages of this website. “The Edinburgh to North Berwick is miraculously still going nowadays. If you Google ‘Edinburgh to North Berwick Race’ this will link you to Brian Howie’s website which includes a list of winners going right back to 1958 when Scottish marathon champion Harry Fenion won the first event. The race distance, which is now 20 miles has varied considerably over the years. In 1971, 1972 and 1973 it was a full marathon. 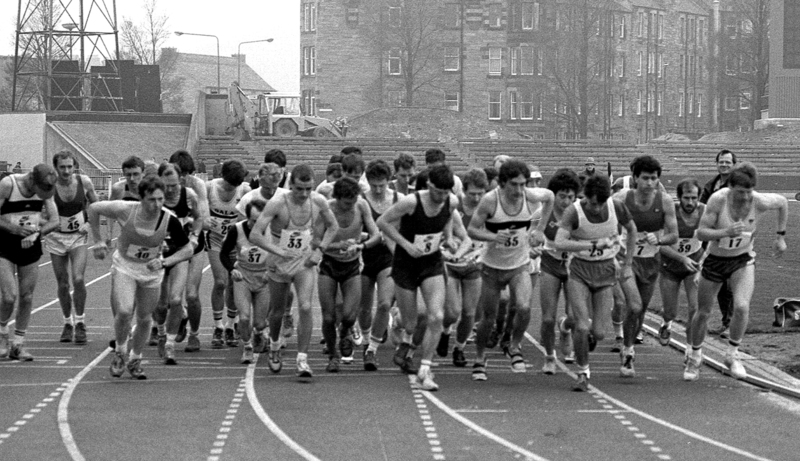 Taking slight advantage of the downhill start from Meadowbank, Alex Wight and his brother Jim ran brilliantly for Edinburgh AC in 1971, with Alex recording 2:15:27 and Jim only 16 seconds behind. In 1973 Rab Heron of Aberdeen AAC was almost as impressive with 2:17:07. When I tried it in 1979 and 1980 it had been reduced to 21.8 miles. My diary for Saturday, 5th May, 1979 states, “Eased away from the pack after four miles, 43 seconds up at 13 miles. Then relaxed too much and was shocked to find Sandy Keith closing fast. Eyeballs out up the hill and through Gullane, etc. Tired on last downhills. Sore feet but best run for a long time.” My winning time – a new course record until EAC’s Lindsay Robertson took over a minute off it in 1982 – was 1:52:13, with Sandy 26 seconds back and Dave Lang a distant third. 54 ran and Maryhill’s world class veteran Gordon Porteous was congratulated on finishing 30th in 2:26:15 at the age of 65! In 1980 I was rather fatigued from previous races and, despite trying to drop Tommy Wiseman into a strong, gusting headwind, this was to no avail. He broke clear and strode off to an easy victory in 1:59:48, a minute clear of me with Martin Craven third. I have the complete Scottish Marathon Club results sheets for the 1958 to 1972 races, inclusive, for the North Berwick to Edinburgh. According to the SMC Minutes, the race was suggested after the Glasgow-based SMC gained some Committee Members from the East. The energetic and confident Harry Curran of ESH was the organiser of the only North Berwick – Edinburgh. Later that year Harry Curran emigrated to Canada (though he seems to have returned by 1964) leaving the organising to Hugh Phillip. The 1959 to 1962 Edinburgh to North Berwick races were actually promoted by the SMC leaving it all to the Eastern members such as Jackie Foster, Neil Campbell, DB Brooke plus SMC officials like Joe Walker, George Aithie and Jimmy Scott. Prizes came from donations and tea afterwards was provided by North Berwick Town Council, who also presented a cup. The Provost presented tha prizes. For the 1959 event it was suggested that a message be sent from Edinburgh to North Berwick. 1958: Inaugural NORTH BERWICK TO EDINBURGH 22 mile. Winner, on 17th May, was Harry Fenion, the reigning Scottish marathon champion, who had been Scottish distance runner of 1957. The field included most of the bests current Scottish distance runners. 1959: 16th May: was won in a new record by Hugo Fox who won the SAAA Marathon in both 1958 and 1959. This time it was actually run from EDINBURGH TO NORTH BERWICK! 1960: EDINBURGH TO NORTH BERWICK was billed as 22.6 miles. The winner was K Pawson well clear of John Kerr who won the Scottish marathon in 1961. 1961: EDINBURGH TO NORTH BERWICK: Terry Rooke from the North of England was one of a growing number of runners from South of the Border who were attracted by the event. 1962: EDINBURGH TO NORTH BERWICK: Charlie Fraser, ESH, in front of John Kerr (Airdrie) and Clark Wallace (Shettleston) all medal winners in the SAAA marathon. By now the organisers were the new Edinburgh AC. 1963: was won, according to the SMC Minutes, by Jim Alder in a new record. 1965 did not take place so the date was given to the Shettleston Marathon. Presumably the 1966 race was cancelled too – only the old Edinburgh AC would know that. A Wight EAC 2:15:27; 2. J Wight EAC 2:15:43; 3. Donald Macgregor ESH 2:19:00; 4. G Bryan-Jones ESH 2:23:47; 5. Tommy Coyle ESH 2:26:39; 6. Gordon Eadie (Cambuslang) 2:27:45; 7. John MacDonald (Lewisvale Spartans 2:29:43; 8. Duncan Davidson Forres 2:35:10; 9. Donald Taylor EAC 2:42:10. It was again a full marathon in 1972. Held on 13th May, 1972, it was won by Donald Ritchie of Aberdeen in 2:24:26. Other places were filled by David Wyper (West of Scotland Harriers) second in 2:24:35; third place runner is unlisted; fourth was Jimmy Milne (Edinburgh AC) in 2:2549; fifth Alisdair Reid (Glasgow University) 2:32:31. On 12th May 1973, it was another full distance marathon but the organisers at Edinburgh AC were disappointed at the poor entry. Only eight finished but a very fit Rab Heron (Aberdeen AAC) aided by a very strong tailwind ran very fast to win in 2:17:07 which topped the Scottish marathon rankings for that season. Steve Taylor (AAAC) was second in 2:23:17 with Graham Milne (AAAC) in 2:24:18; Jimmy Milne (EAC) 2:34:51; Ian Mackenzie (ESH) 2:40:56 and Ian Trapp (EAC) 2:34:51. Joe Small was a good class runner who competed for Monkland Harriers and Clyde Valley who ran in the race twice – the first time was in 1978 and he says – This was my first attempt at a long race. Having decided to try the marathon and only having raced 12 to 15 miles, I thought that the 21.8 miles would be a good stepping stone. Starting from Meadowbank Stadium I sat in the leading pack gradually moving up as others fell off the pace. The group held fairly tightly together as there was a fairly strong headwind until around the ten mile mark when it was whittled down to three – myself, Davie Wyper and Jim Russell. I pushed the pace from there and Jim was quickly dropped leaving me to do all the work as Davie sat in. I tried everything to get clear – speeding up, slowing down, even inviting him to go in front but he didn’t take up the offer! We came into North Berwick, still together and previous knowledge (he’d won the race two years before) allowed him to sprint clear. I hadn’t a clue where the finish was! Dave beat me by 6 seconds with 2:01:50 but I was quite pleased with my first effort at the distance. A couple of years later, in better conditions, I had a really fast run – 1:55 – to finish fifth I think. The race remained in my memory for a couple of things – one was Jack Mclean saying to Eddie Campbell of Lochaber that if he wore shorter shorts he would take minutes off his time, to which Eddie retorted that “If you lived where I live, you’d wear shorts like mine!” The other is a runner telling me after the race that he had dropped out with exactly one mile to go. He got into a car belonging to one of the race officials and spotted the ‘Spangles’ on the dashboard. “Can I have one? was the question, and before he got an answer had unwrapped two and they were in his mouth! It was a good race, very well organised with certificates issued by the SMC and a fine meal afterwards in North Berwick. I was surprised but delighted to hear that it was still being run.